5 years. After retirement, I progressed from digital photography to making my ‘Jan’s Joy’ note cards with the photos. Walked into ‘Stampin’ Cat Studios’ in Salem, OR and was hooked – big time. For the past 3 years have entered the county and state fairs with hand-made cards, winning, and then was asked to teach. Have really enjoyed teaching several techniques in classes every few months. Earth Art International, Michael Strong Rubber Stamps, Magenta, Lockhart Stamps, Great Impressions, and whatever strikes my fancy at the moment. Attention to detail…finish all edges of a cut piece lightly with a black chisel point pen…seeing the white edge of the paper ruins a beautiful piece of artwork. Asian is my favorite theme – graceful and elegant. CHA – that would be a real treat! All of God’s creation…there are small parks all over the city and flowers everywhere, as well as many gardens/growers of iris, daffodils, tulips, peonies, rhodies, lilies, roses, and dahlias around Salem – a photo paradise! I follow a number of blogs and inspiration is just a click away! Nothing formal…did win a ‘Dopey Duck’ coloring contest in elementary school – don’t think that counts – lol! Retired as an Administrative Assistant to the Associate Superintendent of Calaveras County in Angels Camp, CA. in 1995 (yes, the ‘Jumping Frog of Calaveras County Mark Twain fame) frog jumping contests at the county fair every year! Now I sell my ‘Jan’s Joy’ photo note cards…helps a bit to fund my stamping passion! Jim and I have been married 25 years, moved to Salem, OR 11 years ago. Have a grown son, John, living in Stockton, CA, as well as a step-daughter, Denice (her husband, John, and their son, Cody) living in Ocala, FL. We live 5 miles from downtown Salem on our 5½ acre Douglas Fir tree farm. Love Salem…a little-big town and the state capitol. We have mild winters and summers and everything grows here except citrus. Thank you for this opportunity to share with you…very exciting for me!!! I stamped the dragon on ‘Neenah Solar White’ paper using ‘VersaFine’ black ink, embossed with clear embossing powder. Colored with various green ‘Copic’ markers, R29 Lipstick Red, and FY1 Fluorescent Yellow Orange. Cut out the dragon; used my black calligraphy pen to finish the white edges of the paper; and embellished the dragon eye with a mini red rhinestone. Stamped my ‘I Love You’ saying with ‘VersaMark’ and embossed with Chinese Red embossing powder on ‘Black Perle’ cardstock. Punched all four corners of the Black Perle cardstock with a ‘Southwest’ punch; knotted and scotch taped one end of gold string to the back side of the black cardstock; wound the string around all four corners so the solid line of string shows on the front side, then knotted and scotch taped the end of the string on the back side of the black cardstock. Using double sided tape, mounted the black layer to the ‘Red Perle’ A-6 card. Used pop dots to mount the dragon on the black perle layer. He’s a real lover and breathing fire…so look out! 18 Responses to May 2011: Jan C.
I saw this on Flickr first and rushed here to say your dragon is awesome! Susan T.
Thank you Susan! Isn’t he a lover…green is good! Think I should give him a name…hummmmm! Congratulations Jan. . .love your project and enjoyed reading your profile. . .enjoy your month!!! Thank you…I really will enjoy each minute….so excited about it all! 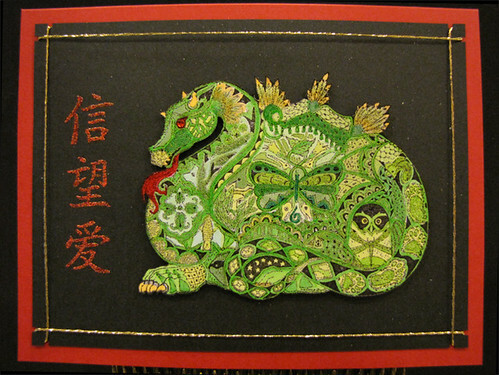 Thank you Leo…I will do my very best…glad you liked the dragon! Well, well, well! Look who’s SAM! You can defnitely keep a secret, Jan. I’m happy to say Congratulations to someone who always makes me smile – and shows me some really cool things. It’s nice to know little more about you, and your lover dragon is superb! He’s a real charmer. Thanks Bonnie…you just named him! CHARMER…how fitting! Everyone has been soooooo helpful along the way and I really appreciate it! Jan – your dragon is totally awesome. Congratulations for a well-deserved honor. Thank you Barb…Charmer-Bonnie just gave me his name – we will both enjoy our month!!! Congratuations, Jan. What a magical looking dragon. He is ready for a Chinese celebration, and is also beautiful if dragons can be such. The design looks as though it was stitched rather than stamped. Love your card,the verse and your terrific coloring of the dragon. Thank you Carolyn! ‘Charmer’ does magical things, as I am seeing with these wonderful comments. This is going to be a wonderful month!!! Thank you Linda…believe me it’s a pleasure sharing…OSA ladies and gents (if any gents in OSA) are a delightful bunch and so helpful! I have never seen that dragon stamp before. Your coloring makes it look more like an applique’ than a stamp. I think I might have to host a dragon swap next year and hope you join so I can get one of those cards. Beautiful work. Congratulations on being May’s SAM. You certainly deserve it. Delighted you like ‘Charmer’ Kathy, and thank you for the congrats! He’s is new on the market – one of the reasons I chose this stamp and it is cut out and popped up with foam tape LOL! If you check out my blog, I just posted a butterfly card made with an ‘Earth Art International’ stamp. http://www.jancastle.blogspot.com/ You can check out ‘Earth Art International’ internet site for their many stamps! If you host a dragon swap next year, PLEASE make it a ONE card to ONE person – as it takes a loooooong time to make one of these, and my time would only allow me to make one!!! LOL! Many congratulations on becoming this months SAM! I am a great fan of your work and your iris folding really inspires!This is a well deserved honour, super project! TFS! Thank you Anne for the congrats. Sorry for the delay to reply here. I do trust you enjoy iris folding too – it’s so – well, oriental! LOL! Try using ribbons for something a bit different…such fun!